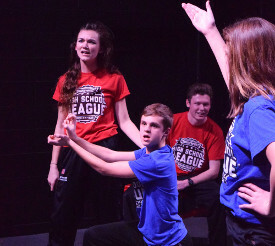 Bishop Chatard’s award-winning Improv Team is one of the most popular extracurricular organizations at Bishop Chatard. Students have a great time while learning important life skills! Besides teaching teamwork and having fun, improvisation develops performance skills that can carry over in many life situations: listening, observing, being in the moment and thinking on your feet. January 24: @ home – red vs. blue 6:30 p.m.
February 5: @ home 6:30 p.m.
February 12: @ home 6:30p.m. February 21: @ home 6:30p.m. February 22: @ Carmel 7:00p.m. February 26: @ home 6:30p.m. March 1: @ Cathedral 6:30p.m. March 14: @ home 6:30p.m. March 25: @ home; main gym vs teachers 7:00p.m. April 10: @ Westfield 7:00p.m. April 11: @ home 6:30p.m. April 16: @ home 6:30p.m. April 24: @ home (Senior night) 6:30p.m. April 26: @ Carmel 7:00p.m. The Improv Team, formerly known as ComedySportz, participates in the ComedySportz High School League which is composed of teams of high school improvisational performers from various schools in the greater Indianapolis area. The teams receive training as individual teams as well as some training with all participating schools together. After training and tryouts through the Fall Semester, ComedySportz matches begin in the Spring Semester. Bishop Chatard’s Vice President of Institutional Advancement, Tyler Mayer, coaches the Improv Team. If you would like to know more, contact him at tmayer@bishopchatard.org.